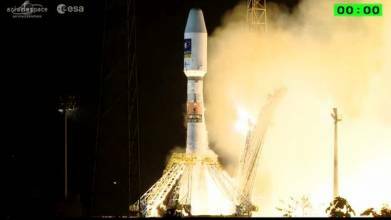 Two Galileo satellites were carried into space today (September 10, 2015) with a successful launch at 10:08 p.m. (EDT) ((02:08 GMT on September 11) from the Soyuz Launch Complex at the European spaceport in French Guiana. The satellites, named Alba and Oriana after Spanish and Russian children, respectively, who won a European Commission Galileo drawing competition, are the fifth and sixth full operational capability (FOC) spacecraft to be launched by the European GNSS program. Developed and built by OHB System AG, the spacecraft were launched on board a Russian Soyuz ST-B rocket. All the Soyuz stages performed as planned, with the Fregat upper stage releasing the satellites in opposite directions in their target orbit at roughly 23,500 kilometers in altitude, about 3 hours and 48 minutes after liftoff. 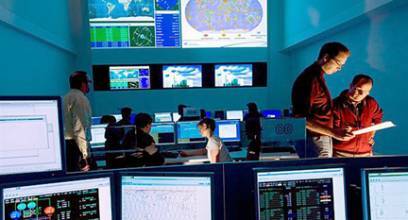 “The deployment of Europe’s Galileo system is rapidly gathering pace,” said Jan Woerner, director general of the European Space Agency (ESA). Two further Galileo satellites are still scheduled for launch by end of this year. These satellites have completed testing at ESA’s ESTEC technical center in Noordwijk, the Netherlands, with another two satellites now undergoing their own test campaigns. Next year the deployment of the Galileo system will be able to be accelerated by the arrival of a new line of specially customized Ariane 5 rockets that will double, from two to four, the number of satellites that can be launched at one time.